U.S. Marine Corps Sgt. 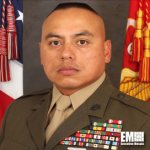 Maj. Vincent Santiago, who currently serves at the 3rd Marine Division in Japan, has been appointed as first command senior enlisted leader for the Defense Security Cooperation Agency in Virginia. The Office of the Senior Enlisted Adviser to the Chairman of the Joint Chiefs of Staff announced Santiago’s new assignment in a press release published Wednesday on the Defense Department website. Hailing from Guam, Santiago joined the Marine Corps in September 1989 and elevated to private first class after he completed recruit training. He was promoted to corporal and eventually placed in the 1st Marine Division in 1991. In 1997, Santiago was transferred to Okinawa, Japan, where he served under the 3rd Maintenance Mattalion of the 3rd Force Service Support Group. The sergeant major was appointed to his current post with the 3rd marine division in 2013. Santiago received military awards such as the Marine Corps Achievement Medal with two gold stars and the Meritorious Service Medal with two gold stars.